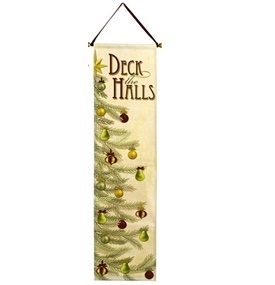 Grasslands Road Deck The Halls Banner Welcome or Deck the Halls. Grasslands Road Deck The Halls collection is a classic design holly with detailed sculpting to create tableware designed to complement Holly Traditions and Boughs of Holly. Hand-painted canvas has ribbon hanger. Banner from Grasslands Road Holiday Traditions collections.